We do not sell finished meat products. We sell cooperative shares of living animals. While making no claims to the organic label, we do not use any commercial fertilizers or pesticides on the land where our animals eat, sleep and live. We try to provide our egg-laying chickens with a fully-organic feed, however the cost for providing this type of feed for all of our animals is quite prohibitive at this time. 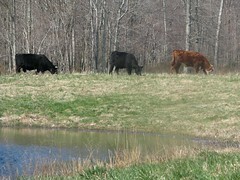 All of our animals have natural pasture on which to roam. From mid-April until mid-November, they derive the vast majority of their calories from grass and forage. 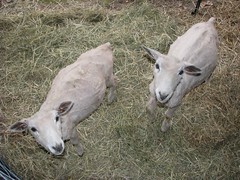 We have also been very careful in the selection of heritage breeds of livestock that thrive on this “traditional” diet.